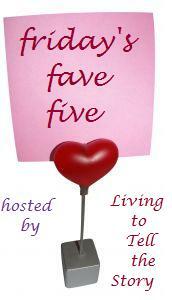 In any case, I'm glad you're here for Friday's Fave Five! Last weekend we went to a Jason Gray concert. It was so, so good. In addition to playing music, he told personal stories and talked about some serious things--heart-killers and relationship-killers like fear and shame. I was especially thankful this week for friends and family who pray. Even as I went through the medical tests, I was comforted by the knowledge that they were praying for me. Our Valentine's Day was sweet: DH and I celebrated with our son by having a special dinner at home. My heart-shaped cake didn't fall apart (as my special occasion cakes tend to do). Our favorite radio personalities, Johnny and Stacey Stone, started their new show on Family Life Radio. The good news is that we can stream the show live. This was a tough week to find five favorites. I'm thankful for Noelle for prodding me (gently) to write a post! What were the best parts of your week? Sorry for the health issues! Glad the screening came back ok. Some of those weeks when it's hardest to find five good things are the best weeks to look for them. Glad you had a nice Valentine's and a couple of fun dates! SO glad you did join us this week. I've decided that thankfulness is highly underrated. It has amazing results in my life when I practice it, and I had never realized it before I read Ann Voskamp's book. I love Jason Gray! And glad to hear you had a fun date night. Hope your week ahead is a good one, Melissa. aw...so sorry to hear you're having health issues!! I like what the person above me says about finding blessings even in tough weeks...I know this past week was a tough one for me (mainly because of teaching issues). I'm happy for you that you got to enjoy a date and had a nice Valentine's!! Enjoy the weekend!! I'm sorry you are having the health issues. But I'm glad that you persevered to focus on the blessings. And certainly having a wonderful husband is #1. So sorry about having disconcerting news health-wise. It is so nice to have the comfort of people who pray around you isnt it. Sounds like you had a good week,minus the health issues. Praying God's strength for you! I want to do a heart cake next year. I bet it is cute! We had a couple's banquet last night at church, it was nice to spend time with my husband. Concerning the heart pancakes: I made regular pancakes, then once they cooled a little, I used a cookie cutter. I found a six pack at Wal-Mart for .97 and they were great! so glad you did this post!!!!!!!!!!!! yay....... what a nice date night.. marc and I need one... we had valentines dinner *and I had the two cutest dates ever!!!!!! !